As part of the celebrations for the Edith Sitwell Festival 2014, lecturer Charles Mundye discusses the poet’s life and work. 2014 is an important year for anniversaries, remembrances and commemorations. A hundred years ago, on 16 December 1914, something sudden and violent happened to the Yorkshire seaside town of Scarborough. In the early stages of World War One a fleet of German naval ships sailed inland and bombarded it with high-explosive shells, killing eighteen men, women and children and wounding many more. In Swansea that December, the one-month-old Dylan Thomas was starting to exercise the vocal cords of what was to become one of the most famous voices of the twentieth century. And fifty years later, in December 1964, a great poet died from the complications of old age. She had been born in Scarborough in 1887, and spent her early years growing up by the sea. By the time of her death she had lived through both world wars and, like Dylan Thomas, had written some of the best-known poetry about the experience of the Blitz, the aerial bombing raids that made the Second World War everyone’s conflict. At the end of this war she wrote an elegy for the dead of Hiroshima, and other poems reflecting on the new post-nuclear age. In a matter of decades the world had moved a long way in its technologies of destruction. The poet in question is Edith Sitwell (1887–1964), and this year marks the 50th anniversary of her death. She remains one of the most overlooked yet astonishingly exciting poets of the last century. A popular image of Sitwell is of an eccentric aristocrat wearing oddly flamboyant costumes, or of her posing as a corpse with lilies for a photograph by Cecil Beaton. It is true that her upbringing was decidedly strange, even by a poet’s standards, and she cultivated a persona as a kind of shell with which to defend against the many cramping difficulties of living, let alone living creatively, in early and mid-twentieth-century Britain. Edith Sitwell as a young girl. By very kind permission of Mrs Alexandra Hayward. However, her poetry is alive with human life and fire; it is hilarious, musical, meditative, religious, and almost always experimental. In the 1930s Sitwell wrote a work of curious cultural biography entitled The English Eccentrics, underlining her interest in the quirky and the different. The etymology (origin) of the word ‘eccentric’ points to a sense of being decentred (from the Greek ekkentros: out of centre). And surely part of the job of poetry as well is to be out of centre, and inhabit places and perspectives that are to one side of the ordinary, to come at things slantwise. Music is organised sound. It’s not a bad way of thinking about poetry too, which is alive to the rhythmic and tonal patterns available to language. Music and poetry both achieve their rhythm through patterns of stress in the sounds they make. Music also arranges its sound through variations and combinations of pitch and timbre; poetry through rhyme and assonance (patterns of vowels) and alliteration (patterns of consonants). Poetry in the first decades of the twentieth century had a tendency towards relaxing some of the regularities of traditional patterns of sound – think of poets moving towards free verse instead of traditional forms with regular rhyme and metre, for example, which Robert Frost described as “playing tennis with the net down”. Sitwell was radical in her insistence not only on the importance, but at times the priority, of the organised music in the poetry, stating as she did that “the poems in Façade are abstract poems – that is, they are patterns in sound”. It is perhaps no surprise that such poetry should attract the interest of musicians, and one in particular became a cutting-edge collaborator with Sitwell, resulting in one of the most extraordinary and daring stage performances of the 1920s. In Façade (1922) the composer William Walton doesn’t set Sitwell’s poems to music so much as provide a sound track to go with their declamation (saying in dramatic mode, not merely reading). In January 1922 Sitwell took centre stage for the first performance, but the audience couldn’t see her, as she sat behind a stage curtain. The decorated curtain had a hole through which Sitwell poked a Sengerphone (a type of megaphone) to declaim and amplify her poems. This was all part of the avant-garde spectacle, but it also ensured that the words didn’t get swamped by the music. 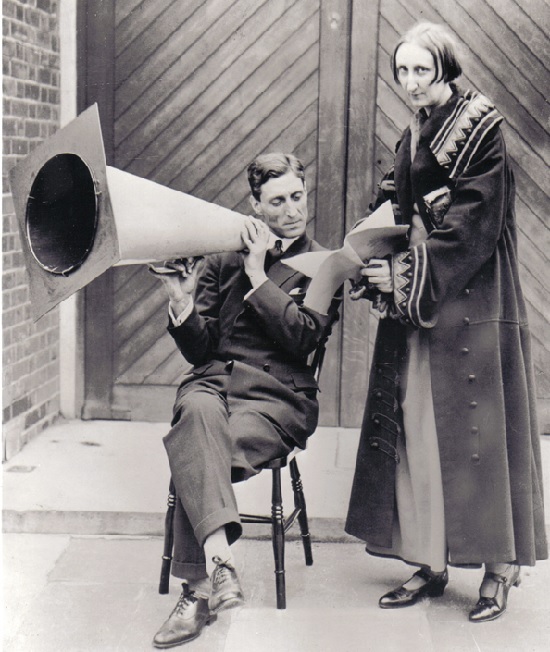 Photo of Edith Sitwell with the Sengerphone used in the performance of Façade, with actor Neil Porter. By very kind permission of Mrs Alexandra Hayward. 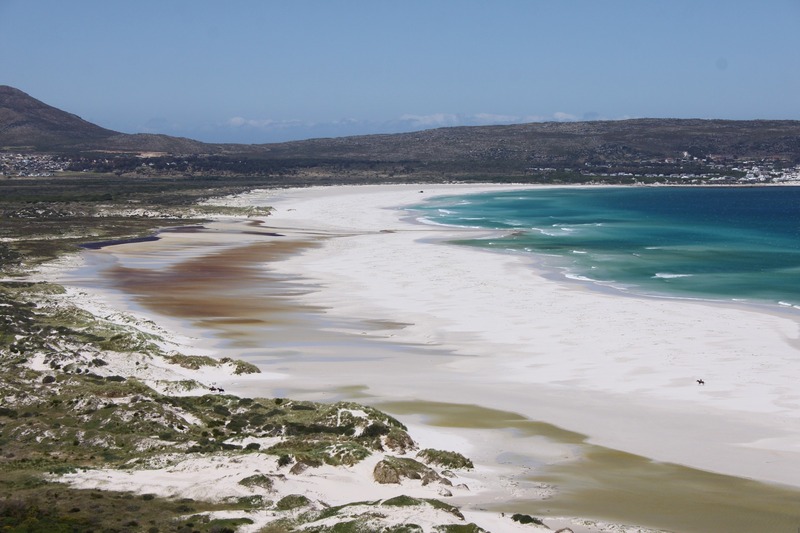 It is no surprise that this poem was set to music by the composer Benjamin Britten in 1954. This anniversary year affords us an opportunity to revisit Sitwell, Thomas, and the musicality of their poetry, to revel in its sound and to think how, more broadly, poetry and music can come together in a variety of different ways. Produce a short sound recording and/or video (maximum 3 minutes) of some performed interaction between music and poetry. You might well be inspired by the technique and/or subject of Façade, as a version of early twentieth-century rap, Sitwell style. You may wish to produce a collaboration or perform alone, to improvise with a wheelie bin or track down a 10-piece brass band. The choice is yours! Write a poem about some aspect of eccentricity. Please feel free to interpret eccentricity as widely and eccentrically as you dare. You should pay particular attention to the musical aspects of your text, the rhythm, rhyme, assonance and alliteration of the words, and attempt to create as concentrated and intense a music as you possibly can. Winners will receive a lovely package of prizes including The Collected Poems of Edith Sitwell, A History of Food in 100 Recipes by William Sitwell, an exclusive Young Poets Network notebook and a stick of Scarborough rock! The challenge is now closed – but you can read the fantastic winners by following the links to the side of the page, and be inspired to write your own poem to submit to one of our Poetry Opportunities! Charles Mundye is a university lecturer in English with particular interests in twentieth century poetry. He recently edited Keidrych Rhys’s The Van Pool: Collected Poems for Seren Books (2012). You can read about the Edith Sitwell Festival 2014, Scarborough, on the Sitwell Society website and on the website of writer Kate Evans. You might also like to find out more about the anniversary of the Scarborough Bombardment and the Dylan Thomas centenary celebrations. I realy love poetry and all the opportunities you giving us as poets,am willing and going to enter these competition.pleasure. Hi Lehlogonolo, that’s great to hear, thank you! And good luck! Thank you for the opportunity, I am a young aspiring writer/poet, happy to enter any competition I can. Thanks for the message, Leora! You might be interested in our list of Poetry Opportunities – magazines, competitions and writing groups which particularly welcome young poets: http://ypnmap.poetrysociety.org.uk/. Good luck! Hi Sharanya, glad you like it! Have fun responding to the challenges and good luck! Hi Sodeera, if you email us at educationadmin@poetrysociety.org.uk with some favourite quotes and links to the poems online we will post on our Facebook page! I write poetry and compose regularly, and I love your challenges but I have never been brave enough to send my poetry. Would it be ok to compose a musical manuscript and then put words to it. Thank you. Hi Morghan, yes that would be absolutely ok! As long as it links music and poetry in some way, it fits the challenge. Have fun with your composition! Hi there! I was wondering if we’re allowed to submit poetry that we’ve performed. Thank you! Hi Jeanette, rock is a traditional seaside sweet in the UK – a hardboiled candy in the shape of a long, thin cylinder with letters in it, running all the way through – the letters will read the name of the town it’s sold in, in this case Scarborough! Hi Jeanette, is it something you’ve written for the challenge and performed? If so, then please do send it in! What I meant was something we’ve written and performed for a school event. Thank you! Hi Ayesha, thank you for your kind words, we are delighted that you like the YPN challenges!